The Pest Control Alert is an email newsletter and blog from UGA for the structural pest control industry. These Alerts are designed to anticipate industry needs and to use UGA resources to address emerging issues like pesticide resistant insects, integrated pest management of emerging pests (Africanized bees, kudzu bugs, Formosan termites, etc.) and pesticide regulatory changes. The newsletter is coordinated by the Center. 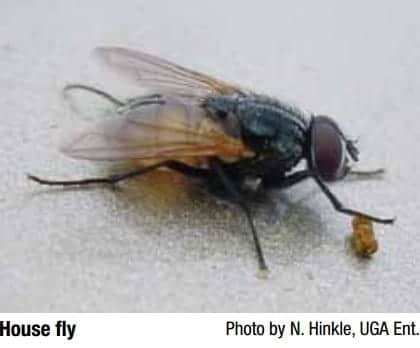 The key contributor to the Alerts, the Urban Pest Management Program at the UGA Griffin campus, responds to challenges with up-to-date research, reports and trainings. The Pest Control Alerts are emailed to nearly 500 people, many of whom share the information with co-workers. An on-line readers survey indicates that 96% of those responding have learned something they plan to use from the Alerts. The Alerts are impacting the Georgia structural pest control industry! Examples of industry comments on the Pest Control Alerts include "Timely news - your site DELIVERS!" and "Keep them coming." Extension personnel comments include "I ... always learn from your alerts. Our industry professionals also love to receive it as I pass it on to all of them." "Our office staff and Master Gardener Volunteers use these pest control alerts to educate themselves for our clients. These alerts let us know what is out there." ￼￼For more information email ebauske@uga.edu or dsuiter@uga.edu. Inherently, agricultural and outdoor workers experience a greater risk of mosquito bites that can vector illnesses such as chikungunya, dengue, Japanese encephalitis, West Nile, and Zika virus disease. The CDC and EPA recommend using EPA-registered insect repellents containing DEET, picaridin, IR3535, oil of lemon eucalyptus, or para-menthane-diol to protect workers against these infections. Fact sheets and posters have been released by the Centers for Disease Control & Prevention, Occupational Safety and Health Administration (OSHA) and the National Institute for Occupational Safety and Health (NIOSH) outlining the Zika virus to promote education and communication regarding practices to reduce worker exposure. When pest problems occur there is usually one or more of these requirements readily accessible to the pest. The preferred living environment for most humans also provides the necessities many pests need to satisfy their life support requirements. 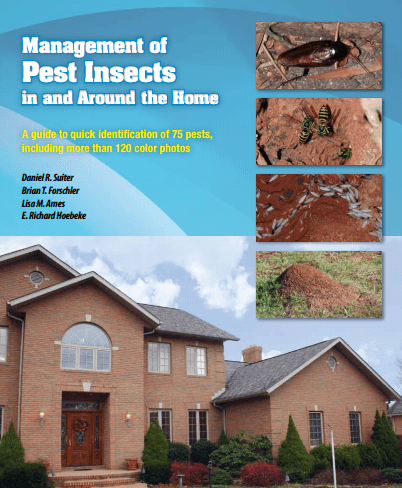 Therefore, it is important that homeowners limit pest access to potential sources of food, water, and shelter in and around the home in an effort to keep our personal living space inhospitable to unwanted house pests. Proactive pest management is a process that begins with identifying the pest and using information on the biology of the offending creature to decide upon a plan of action. The action plan should involve interventions aimed at reducing pest population numbers or the chance for future encounters with that pest. General rules of cleanliness during food preparation, storage and disposal is the logical starting point for helping to resolve and prevent certain pest problems. Denying pests access to food is an important component of making our living environment less hospitable to pests. Ensure that discarded plant waste is removed twice per week, at a minimum, especially during the summer (Figure 2). Daniel Suiter (dsuiter@uga.edu) and Brian Forschler (bfor@uga.edu) are Professors of Entomology, specializing in urban entomology, in the Department of Entomology at the University of Georgia; Suiter is located on the university’s campus in Griffin, while Forschler is on the main campus in Athens, Ga.
Lisa Ames (lames@uga.edu) directs the Homeowner Insect and Weed Diagnostics Laboratory on the UGA Griffin Campus. Richard Hoebeke, a systematic entomologist, is the associate curator of insects at the Georgia Museum of Natural History on the UGA’s main campus in Athens, Ga (rhoebeke@uga.edu). The registration fee ($75) includes the 1 day workshop, instructional materials, lunch, and refreshments during the course of the workshop. IPM Workshops are limited to 25 participants, so register early to reserve your spot! Urban and structural pest management is the protection of property, food, and health from insect and rodent pests commonly found in homes, restaurants, and other businesses. The goal of this workshop is to teach participants how to generate and interpret the information required for effective Integrated Pest Management (IPM) programs. A Unique Training Opportunity. An insect identification laboratory is part of the workshop. During the laboratory session, participants will see dozens of pest species, and/or signs of their presence, commonly found in and around Georgia’s urban environment. Completion of the 1-day workshop provides 5 HPC hours (Cert/Reg) and 4 hours credit in Category 35. A “Certificate of Completion” will be awarded at the completion of the workshop. Find more info here or contact Dr. Daniel Suiter at 770-233-6114. In 2014, Georgia reported 13 human cases of West Nile Virus (WNV), with 1 death. Eleven (84.6%) of the 13 cases experienced WNV neurologic illness (altered mental status, paralysis, encephalitis, and/or meningitis) and 2 (15.3%) were diagnosed with WNV fever. See the entire survey in the May edition of DIDEEBYCHA, the newsletter of the Georgia Mosquito Control Association. Mosquito Control is a growing part of the landscape industry. Commercial applicators of mosquito control products need to have pesticide applicator certification in Category 41, Mosquito Control. UGA Entomologist Elmer Gray has recorded an online video to better prepare applicators to take and to pass the Category 41 pesticide exam. Note that the video is a supplemental help to those studying for the exam and is not a replacement for studying the manual! Applicators should order and study the manual before taking the exam. If the applicator has not already passed the general standards exam through the GA Dept of Ag Pesticide Division, they will also need to order that manual, study and also pass that exam as well. Find more information on the Georgia Department of Agriculture pesticide division and applicator licenses. Excessive, persistent moisture is the most important condition allowing many types of pest infestations to establish and persist. Not only is water critical to the health and normal metabolism of all forms of life, its abundance leads to the growth of various molds, fungi, and other microorganisms which are the primary food source for numerous insect species. 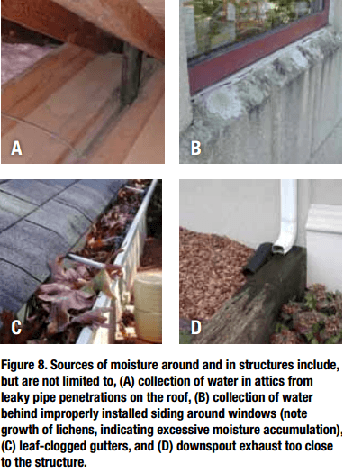 Downspout and air conditioner drain lines that deposit water within five feet of the structure (Figure 8D). There is no standing water or persistent wet spots next to the foundation or in the crawlspace. As part of EPA’s ongoing effort to build a more user-friendly website, we have transformed our Managing Pests in Schools website into a new, easy-to-use format. Information on school Integrated Pest Management (IPM) should now be easier than ever to access, regardless of the type of electronic device being used, including tablets and smartphones. IPM is an effective and environmentally sensitive approach that offers a wide variety of tools to reduce contact with pests and exposure to pesticides. 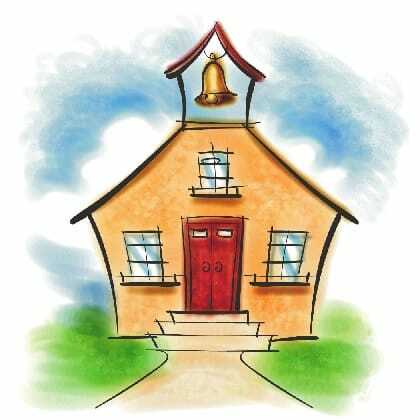 The website focuses on providing vital information in the school setting for parents, school administrators, staff and pest management professionals. Knowledgeable, proactive stakeholders can help a community prevent or significantly reduce risks from pests as well as unnecessary pesticide use. The old Web pages will redirect to the new website, and we encourage visitors to update their bookmarks with the new URLs. 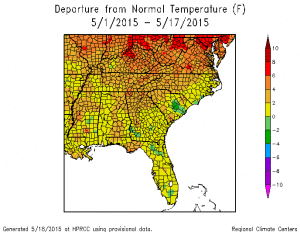 May 2015 is half over and it is time to see how the monthly climate is doing so far. The maps from the High Plains Regional Climate Center below show that for the region as a whole, temperatures are running about 1.5 degrees above the 1981-2010 normal, while the precipitation is much below normal and in some areas none has fallen at all, which is shown on the “percent of normal precipitation” map as an area of dark red, indicating zero percent of normal rainfall for the month. 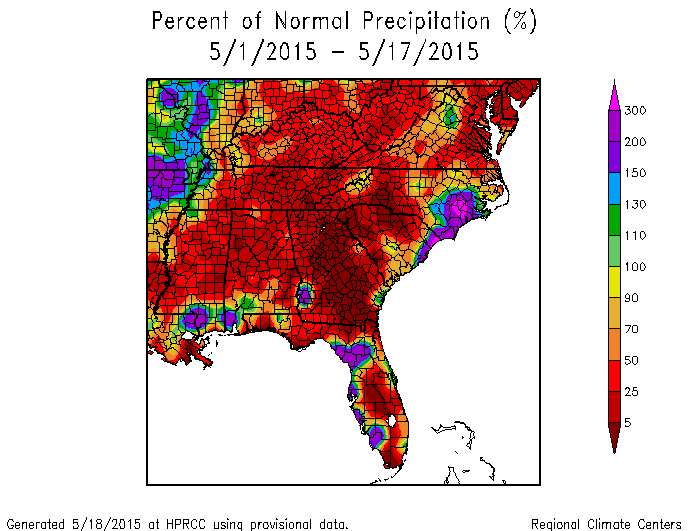 Atlanta broke their record for the driest start to May before finally getting rain on 5/17. Athens, GA is the driest May to date on record and Macon is tied for the driest, although rain is likely at both locations this week. For the rest of the month, warmer than normal temperatures are expected to continue. Rainfall is expected to increase and may even be above normal for the rest of the month, although it will be spotty. A hybrid colony of Coptotermes termites. A king C. gestroi (nutty-brown abdomen) is shown on the left, and a queen C. formosanus (orange abdomen) on the right. They are surrounded by their hybrid offspring, including eggs, larvae, workers, and soldiers. Photo by Thomas Chouvenc, University of Florida /IFAS. Author Richard Levine is Communications Program Manager at the Entomological Society of America and editor of the Entomology Today Blog. 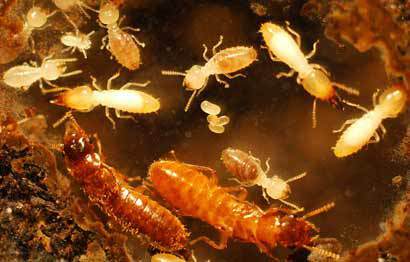 Formosan subterranean termites (Coptotermes formosanus) and Asian subterranean termites (Coptotermes gestroi) are the most damaging pest species in the world. Both are highly invasive and have spread throughout many areas of the world due to human activity, and their distributions overlap in some areas. Now scientists in Florida have observed Formosan males mating with Asian females — in fact, they seem to prefer the Asian females more than females from their own species — and their hybrid offspring seem to grow colonies twice as fast as their parents. Their findings are published in the journal PLOS ONE, and are described in this video. Many hybrids are unable to reproduce (the mule, for example, which is the sterile hybrid offspring of a male donkey and a female horse). And many hybrids that actually can reproduce tend to lose vigor after one or more generations, which is why farmers often buy new hybrid seeds each growing season. But so far that doesn’t seem to be the case for these termite hybrids. In the laboratory, the Florida researchers are raising a hybrid colony that is growing twice as fast as same-species colonies, suggesting a potential case of hybrid vigor. “Our hybrid colony is still showing high vigor, can potentially live up to 20 years, and can still cause a significant amount of damage,” said Dr. Thomas Chouvenc, a co-author from the UFL’s Ft. Lauderdale Research and Education Center. While these laboratory observations remain to be confirmed in the field, the results still raise a concern about the hybridization of these incredibly destructive pests, which could have significant economic impacts, according to the authors. To get an idea of how potentially destructive they could be, watch this video of University of Florida researchers observing both termite species swarming and mating simultaneously. 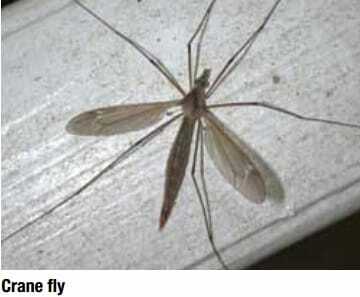 Crane flies have long legs, a long slender body, and vary in body length from 1/16 to 1 inch. 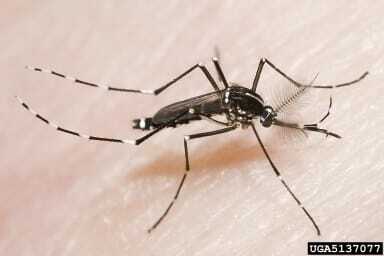 Some crane flies may resemble large mosquitoes. Color will vary depending on species, but one common species is light brown or tan. The larvae are called leatherjackets and can damage lawns by feeding on the roots of grass. Habits: Crane flies generally rest with their legs spread widely. Adults feed on nectar or do not feed at all; many have vestigial mouthparts. Once they become adults, most crane flies simply mate and die, all within a few days. They do not bite humans. Might Be Confused With: mosquitoes. The most common species have red/orange eyes, but not all fruit flies have red/orange eyes. 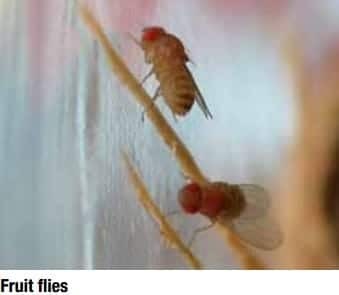 Fruit flies often hover around and just above food (most often decomposing vegetable matter) prior to landing. Flies are 1/8 inch. Habits: Feed mainly on decaying vegetable matter, compost, rotting fruit, etc. Often found around salad bars and restaurants where vegetable matter and juices collect. Also called vinegar flies, since vinegar (acetic acid) is a decomposition product of some rotting vegetable matter. Interventions: Find larval fly feeding site(s) and clean or otherwise throw away rotting fruit or vegetable matter. Remove garbage, including the plastic liner, and other refuse at least twice per week. 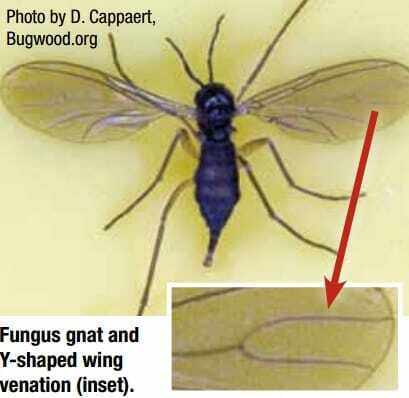 Might Be Confused With: humpbacked flies, fungus gnats, moth flies. Small (1/16 inch) fly with smoky black wings. Y-shaped wing venation is characteristic. Habits: Often found in over watered plants indoors or in otherwise wet conditions. Interventions: Find larval fly feeding site(s) and clean or otherwise dry out. If desired, apply a soil drench with an appropriately labeled liquid insecticide. Might Be Confused With: mosquitoes, fruit flies, humpbacked flies, moth flies. Strongly-segmented larva, 3/4 to 1 inch, with two 1/16 inch protrusions from one end. Adult flies rarely seen, but are 3/4 inch and appear wasp-like and with two clear spots on upper abdomen. Habits: In homes, larvae usually found in the bathroom. Presence in bathroom may be indication of sanitary (sewer drain or septic tank) problems because larvae feed in putrid, wet conditions. This insect also lays eggs and larvae develop in piles of damp organic matter such as compost piles. 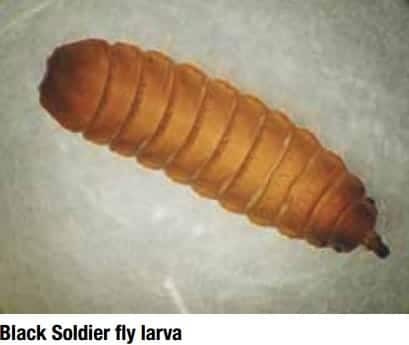 Like many fly species, larvae are known to wander well-away from their breeding site into areas where they pupate. Interventions: Find the larval food source and address the problem by sanitation or moisture management. Might Be Confused With: adults look like wasps. The most recognizable of all fly species. Black, drab, 1/4 inch, fast-flying, often numerous around garbage cans and related refuse areas. Habits: Breeds in garbage, trash, animal waste, and other organic refuse. Like most flies, found most frequently breeding in overly liquid or wet conditions. Often associated with unsanitary, unkempt conditions, such as areas abundant in animal waste or human garbage/landfills. The term maggot is most commonly used in reference to this fly’s larval stages. Because flies are pushed by prevailing, local winds, their source may be from some distance away. Interventions: Proper sanitation and exclusion is an effective means of reducing fly numbers. Indoors deploy and maintain sticky traps associated with attractive lights (commercial insect light traps) and/or the chemical attractant Z-9-tricosene. Be sure that indoor light traps are situated so that they cannot be seen by flies from the outside. There is no scientific evidence to support claims that a hanging bag full of water serves as a deterrent to house flies. Remove garbage and other refuse at least twice per week. Might Be Confused With: blow flies. Also referred to as scuttle flies or coffin flies. Often scuttle about on the surface around and on infested materials. 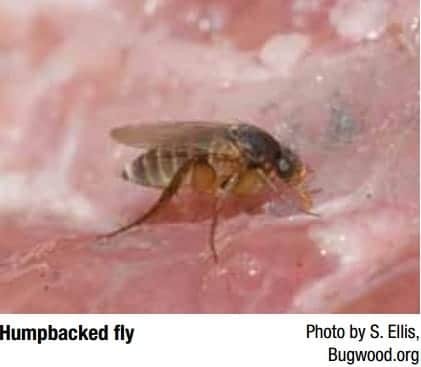 Humpbacked flies are about 1/8 inch. Habits: Often associated with dead and decaying animal or plant matter (e.g., dead insects, rotting potatoes), bacterial buildup in drains (drain and sewer scum) in bathrooms and kitchens, and in/around garbage cans. Interventions: Find and clean fly breeding sites and/or clean out drains. Make certain that the water trap in the drain line (especially common in less frequently used sinks) is filled – if the water trap dries out, flies and other pests that live in the drain lines will be able to enter the building. Remove garbage and other refuse at least twice per week. Might Be Confused With: fruit flies, moth flies, fungus gnats. Also referred to as bluebottles and greenbottles. 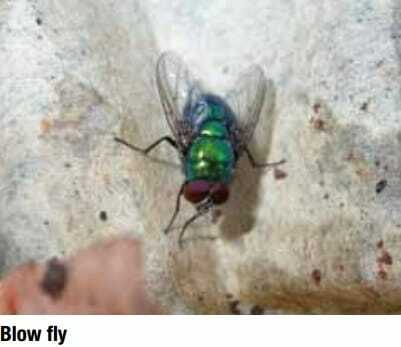 Large, robust, fast-flying flies, 1/4 to 3/8 inch, commonly shiny and with metallic blue, green, copper, or gray coloration. Some species strongly bristled, some with stripes on their pronotum (upper thorax), and some with large, reddish-brown eyes. Resemble house flies in their flying behavior. Habits: Flies attracted to and breed in recently dead and decaying animals and animal waste. When suddenly present in large numbers, and when present indoors (typically at windows sills), is highly suggestive of a dead animal indoors (e.g., attic, crawlspace, wall void, fireplace, etc.). Interventions: Find dead animal and remove it. Maintain window and door screens to prevent entry into the house. Remove garbage and other refuse at least twice per week. Might Be Confused With: house flies (especially the maggots). 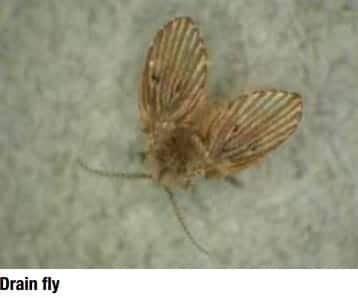 Also referred to as moth flies. Oblong or oval, appears moth-like, and is about 3/16 inch, wings fuzzy. Larvae up to 3/8 inch. Habits: Commonly found in bathrooms (breeds in scum in drains, showers, overflows, toilet bowls, etc.). Adults rest motionless on walls until disturbed, and then fly well. Need wet conditions to breed. When toilets have gone un-flushed for an extended period, moth flies may lay eggs in the toilet tank, and larvae can be found there. When the toilet is finally flushed, larvae can make their way into the toilet bowl, where they are discovered. Interventions: Clean the inside of the drain of all scum and detritus using a mild cleanser and a bristled brush. 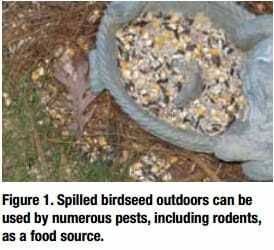 Never pour insecticides into drain. Pouring bleach into drains is not effective. Make certain that the water trap in the drain line (especially common in less frequently used sinks) is filled – if the water trap dries out, flies and other pests that live in the drain lines will be able to enter the building. To help determine whether a particular drain is infested, place a clear cup, inverted, over the drain. If flies emerge from the drain, they will be trapped by the cup, and can be seen. Might Be Confused With: fungus gnats, humpbacked flies, fruit flies, and small moths.